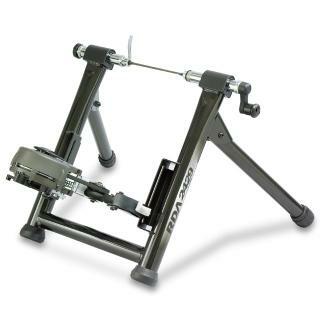 Minoura, who have a reputation for innovation when it comes to indoor bike trainer technology, has developed the world’s only rim drive turbo trainers. 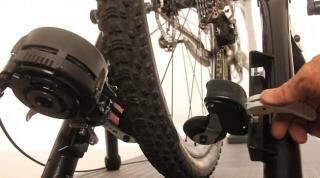 They also invented the magnetic resistance brake that is not adopted by most of the big brands in trainer manufacture. The main advantage of a rim drive trainer is the elimination of tyre wear, which is a concern with standard turbo trainers. There are two versions of the 2439 model, one without a handlebar mounted resistance shifter and with, namely the RDA2429-D and RDA2429-R respectively. 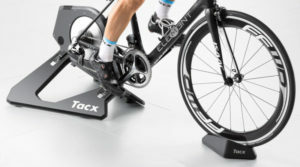 Another issue with traditional trainers is that knobbly tyres tend to cause a lot of vibration noise, but with the rim drive trainers this is completely eliminated, meaning you get an ultra quiet workout whatever wheel type you use. The resistance to the back wheel of your bike is provided by a rubber roller that pushes against the rim of your wheel (i.e. the same area that your normal bike brakes push against). 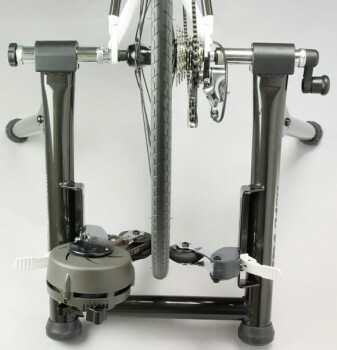 You can set the resistance to 7 different levels, and as mentioned this can either be pre-set on the brake itself prior to your workout, or adjusted with the handlebar mounted resistance shifter at anytime.